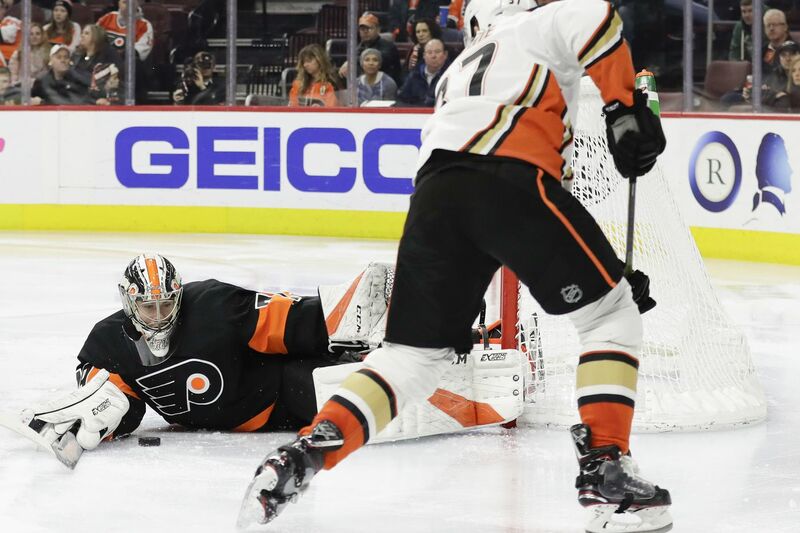 Flyers rookie goaltender Carter Hart lays on the ice with the puck against Anaheim left winger Nick Ritchie during a 6-2 win over the Ducks on Saturday. Because of their proximity, their dislike for one another, and the rivalry’s long history, the matchups between the Flyers and Pittsburgh Penguins always create a buzz. Monday’s meeting at the Wells Fargo Center, however, will be even extra meaningful for the home team. The Flyers, who were 18 points behind the Penguins on Jan. 13, have a 10-game points streak (9-0-1) and have inched to within six points of slumping Pittsburgh, which holds the Eastern Conference’s final wild-card spot. And, so, yes, the stakes are high for the Flyers (25-23-7) on Monday. The teams have three games left against each other, including the Feb. 23 matchup at Lincoln Financial Field. The Penguins (28-20-7) have lost four straight, and their power play is 1-for-19 over the last eight games. That has followed a sizzling 10-for-22 stretch during an eight-game winning streak. Penguins star center Evgeni Malkin, who has 55 points but a minus-18 rating in 50 games, is expected to miss his sixth straight game with an upper-body injury. That means most of the Flyers’ defensive focus will be on superstar Sidney Crosby, who has 94 points in 64 career games against Philadelphia. Flyers rookie goalie Carter Hart will face the Penguins for the first time. He will be trying to become the first goalie in NHL history to register nine straight wins before his 21st birthday. “He’s always in control. … and that spreads through the team,” Gordon said. Hart has a 2.35 goals-against average and .934 save percentage during his eight-game winning streak. On Dec. 1, the Flyers scored a 4-2 win (with an empty-net goal) in Pittsburgh in the teams’ only meeting so far this season. Anthony Stolarz made 30 saves in that victory. The game turned after Wayne Simmonds – despite being five inches shorter and 70 pounds lighter -- challenged 6-foot-7, 255-pound Jamie Oleksiak to a fight with the Flyers facing a 1-0 first-period deficit.